I am very fortunate. I come from a very nice family. I am also a member of another very nice family, the Flein’s (They asked me not to use their real name.) I have sat at their Seder table many years. I also love to break fast with the Fleins at the end of Yom Kippur. 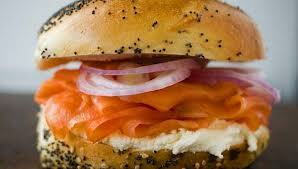 Never has a bagel meant so much. I delight in the spread of spreads of salads and well-prepared slices of lox, tomatoes and, the perfect homemade kugel by R.
What made this year different from all other years? Technology. Within a half hour of exchanging hugs and kisses, iPhones were all over the place. If they weren’t talking about the phone, they were talking about the various protective cases and how it changed their iLives. I could see the late matriarch, Mother Flein, nodding her head and wondering out loud as she sipped her slivovitz, “What happened to conversation?” That’s okay, Mother Flein, your eldest daughter and I were all over that, we wondered the same. “Do you have this?” “How do I get that app?” I love that app.” “Draw something and see if she (a relative on the other side of the room all teched up) can guess what it is,” I was ordered. I am still waiting for someone to acknowledge my naive, delicate work of art. The evil app of the evening award goes to the one that separates the young from the old. It emits a sound that you can hear if you’re under 45 and will never hear if you’re over 45. Oh, what fun! 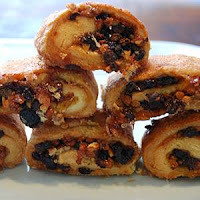 What happened to the break fast where the best and most exciting thing you could have in your hand was a fully dressed, wonderful bagel and then, for desert, rugelach?